Full-service spa onsite sits alongside the beautiful Keystone Lake private ski shuttle to the slopes valet parking multiple onsite restaurants and bar. 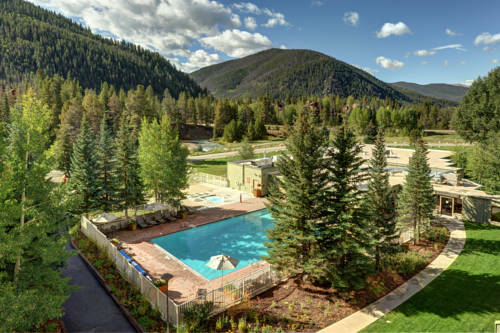 The Keystone Lodge and Spa is surrounded by the majestic Rocky Mountains and thousands of acres of National Forest making it the ideal choice for winter sports enthusiasts. The Lodge boasts easy access to a host of winter and summer activities including skiing and snowboarding ice skating mountain biking championship golf stand-up paddle boarding and more. Take a break from your adventures and relax in our state-of-the-art Spa with a full range of rejuvenating spa treatments. The Spa also includes a steam room indoor and outdoor hot tubs and an outdoor heated swimming pool. Treat yourself to an exceptional dining experience at the Bighorn Bistro while taking in the splendid views of the Continental Divide and Keystone Lake. Or grab a quick bite at the convenient Lakeside Deli or Edgewater Cafe before heading off on your days adventures. Getting to the slopes is easy with the Lodges Gondola Express shuttle service. Our private van will whisk you direct to the base of the gondola. Plus as a Lodge guest you receive free ski check next to the gondola and a complimentary Fast Pass which allows you to use the ski school line prior to 10am. The Lodge has 152 guest rooms including 14 loft suites. Each room affords a spectacular view of the mountains and the Snake river. Suites are two levels with one king bed upstairs and a sitting area with sofa sleeper downstairs. All rooms include complimentary in-room Wi-Fi complimentary fitness center access plush robes and many other amenities. The Lodge has a business center and over over 10000 square feet of meeting space.